This past summer, young Master Bertram would spend at least 20 minutes watching the construction work taking place along one of the main drags where we live. Bertram was particularly obsessed with the blue dump truck, the backhoe, and the front-end loader. One day, the man directing traffic around the construction site even gave Bert his orange flag. Bertram waved that flag, which was quite heavy for a 2.5 year old to carry, up and down the street with glee. Thus when the time came to decide upon this year's Halloween costume, I was not surprised that Young Master B chose to dress up as a construction worker. Of course, Bertram wanted to be not just any generic construction worker, he wanted to be The Flag Man. Parental Unit#2 and I got down to business with grand ambitions of making a family costume around the theme of construction work. Parental Unit #2, who is mighty fond of the color orange, decided to dress up as a traffic cone at one of the many Halloween events we attended. 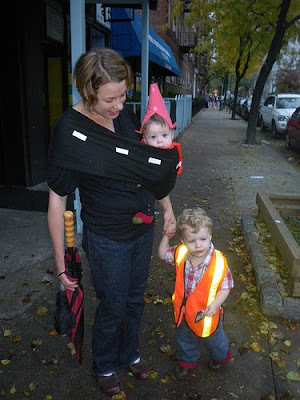 I scaled down the hat he made to fit the little lady, and the next thing you know, she was the traffic cone. Since I had to carry the traffic cone, I became the road. Note that the sling I'm wearing has two lanes. When we went trick or treating, one of our friends observed that Parental Unit #2 (who sadly didn't manage to procure another costume after his traffic cone debut) could be considered the pot hole. 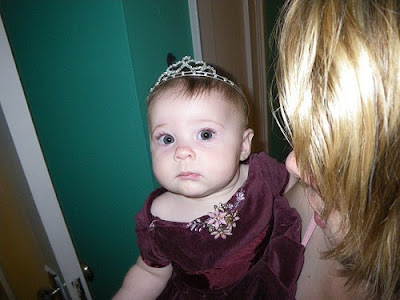 As tradition dictates, this was the third year of our Baby World Leader Costume Contest. Since we host the contest, we don't compete officially, but we always have an entry. Unfortunately, Young Master B is going through a phase where he refuses to have his picture taken. He prefers to click the camera buttons and scroll through previous shots. Knowing this, I decided to focus on young Miss V as Queen Victoria. The picture shown above is one of my favorite outtakes. that would be 20 minutes a day, or even 20 minutes every time we passed. Not just one 20 minute session. I considered if we should do a last minute switch to Vampire, since pore Mr Danger had just hit his teeth on a chair earlier in the day and had bloody teeth. So maybe he was a Vampire Construction Worker.